Davis Key Fob With Emergency Buoy | OhGizmo! I guess this is one of those products that’s a must-have the next time it happens. I’ve personally never lost my keys over the side of a boat but if I did I guarantee I’d have one of these the next time I set sail. The Davis Key Fob is a relatively small keychain that within 30 seconds of being dropped in the water will open up and inflate an air tube causing your keys to float back up to the surface. The air tube itself also extends about 14 inches above the surface of the water which makes it easier to reach and retrieve. Be aware though it’s a one-time use scenario so you might want to pick up a few spares if you’re a particularly clumsy person or prone to pratfalls. 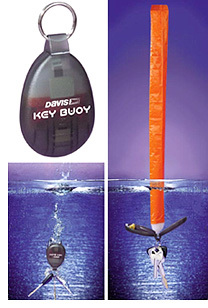 The Davis Key Fob with inflatable buoy is available at Landfall Navigation for only $6.99.